As Interpreter Reads Answer, Modi is Accused of 'Scripted' Interview. Again. For the first time in the annals of Indian diplomacy, the official interpreter elaborated on a laconic prime ministerial reply. New Delhi: Taking a swipe at Prime Minister Narendra Modi, Congress president Rahul Gandhi on Monday accused him of giving scripted interviews and said it would be an “embarrassment to us all” if he did take “real” questions. “The first Indian PM who takes ‘spontaneous’ questions that the translator has pre-scripted answers to! Good that he doesn’t take real questions. Would have been a real embarrassment to us all if he did,” Gandhi said on Twitter. Gandhi was referring to an interview Modi gave at the Nanyang Technological University (NTU) in Singapore on June 1 during his recent visit to the city-state. 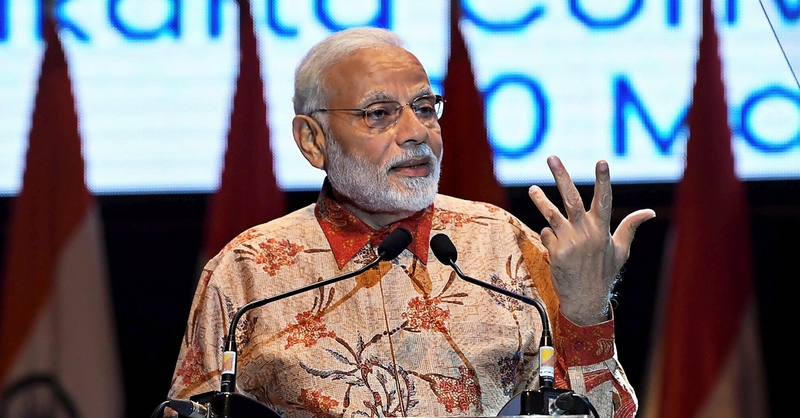 After Modi answered the first question put to him by NTU president Prof S. Suresh, his official interpreter, Nilakshi Saha Sinha, translated what he said accurately. But when Modi finished the second part of his answer, the interpreter translated him but then read out several additional sentences that Modi had not said. This has prompted speculation that NTU – like all the others who have ‘interviewed’ Modi before – had to submit their questions in advance and that the PMO prepared some sort of script for the prime minister’s replies which the interpreter ended up reading from, even though Modi did not say the things she “translated”. What Modi said: Thank you Suresh, mein samajhta hoon ki koi interpreter hai. Mein sabse pehle toh Singapore government ko, and NTU ko and mere mitr Suresh bohot bohot badhai deta hoon is uttam sanstha ke nirmaan ke liye. Aur mein jahan, jitney logo se mera milna tha, kuch hi samay tha mere paas, jo kuch bhi maine deekha ek prakar se badalte hue vishva ke usme ek jhalak thi. Aur aap innovation kar rahe hai aisa nahi hai, aap ek nayi vish ka garbhadan kar rahe hai. Main aap sabko badhai deta hoon. What the translator said: Thank you Suresh. First of all, to the government of Singapore, NTU and Suresh, I would like to heartily congratulate you. Here you have put up, you have established an institution, and whoever I’ve – such a good institution, par excellence, and whoever I’ve had the opportunity to meet and whatever I’ve seen so far. This is a glimpse of the changing world. It’s not just innovation that you are doing here in NTU, you are giving birth to a new world. Once again my heartiest felicitations. What Modi said (part-2):Suresh ne mere samne prashan rakha hai, ki Asia ke ujjwal bhavish mein kaunsi chunotiyan hai. Ek baat nishchit hai ki pura vishva is baat mein convince hai ki 21st century Asia ki hai. Sabse badi chunoti yeh hai, ki hum Asia ke log ise feel karte hai ki nahin. Sirf kaan pe sun kar ke hamey khushi ho rahi hai, ya hamare bhitar bhi voh bhav jag raha hai ki yes, ikkisvi sadi ko Asia ki saadi banake rehna hai. Yeh ek bohot bari chunoti hai, aaj bhi hum duniya ke aur bhubhag se itne prabhavit hai kyunki saadiyon se humne us prakar ki zindagi guzaari hai. Isliye kabhi hume bhi nahi lagta hai ki haan, ab humari baari hai, hum kuch kar sakte hai aur humme karna hai. What the translator said (part-2): The question that was posed to me by Suresh was the main challenges, Asia’s main challenges, and how can we resolve them. First of all I think the biggest challenge before us is that the 21st century belongs to Asia and do we really feel this ourselves, do we have this sentiment. I think that is the biggest challenge because in this part of the world we have been so much impressed by the rest of the world that we do not feel that now it is our turn. Asia has seen the maximum rise in prosperity, opportunity and freedom in the world. Japan led the process, Asian Tigers followed, China has become a major economy and it is India’s turn to sustain progress now. Yet Asia has many common challenges. South Asia, Southeast Asia in particular have many similar strengths and opportunities, weaknesses and challenges. There are the following challenges that are common– skills for the digital age, creating adequate jobs in the age of digital reception, agricultural productivity, water, pollution, rapid en masse urbanisation, sustainable habitats and affordable housing, climate change, protection of biodiversity, building sustainable infrastructure, affordable healthcare, protecting our ocean or blue economy. These challenges require collaboration across governments, universities and laboratories. Policy interventions are important. A lot of finance would be needed but given the scale and magnitude, we need innovation and technology to address these challenges. These should be the priorities for our government. Apart from this one glitch, however, the interpreter stuck closely to Modi’s actual words for the rest of the interview. Modi, who often mocks Rahul Gandhi’s oratory, is criticised for his reluctance to field impromptu questions. He has yet to hold a press conference four years after becoming prime minister and only interacts with the media via interviews involving pre-selected questions, many of which are flattering. In the NTU interaction, Prof Suresh ended his interview with a question about how Modi manages to work so hard all the time. Modi replied that the suffering of the poor and the sacrifices of Indian soldiers do not allow him the luxury of sleeping peacefully at night. He also boasted that he had not taken “even a 15 minute vacation” since 2001.